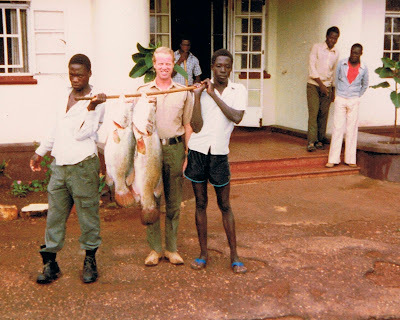 One of my tasks in Uganda in 1983, was to buy all the victuals the Officers' and Sergeants' Messes used. Fresh vegetables and fruit I bought in the local markets, but most meat I bought frozen in Kenya, going once a fortnight to Eldoret and once a month to the NAAFI in Nairobi. Sometimes I did visit the slaughter houses of Kampala, but then I tended to choose the meat while it was still on the hoof to try and ensure I got a healthy animal. For the Officers' Mess I was the President of the Mess Committee as well as the Food Member and consequently worked out all the menus. 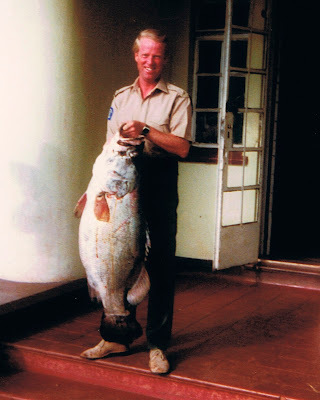 I often supplemented what we ate with the fish I caught in the Nile, as we were based in Jinja right at the source, where the Nile left Lake Victoria. 2 Nile perch caught before tea. I ran the Officers' Mess just like any other British Officers' Mess with the corresponding meal times, so we had, breakfast, morning coffee, lunch, tea and dinner in the evenings. Feeding young hungry men, who are away from home, and can not visit pubs or restaurants of their own accord to relieve the monotony of barracks life, is no easy task. The food in the mess was consequently always the highlight of the day and having a cake at tea was too. The staff we had, as you can see from the photo were all young men, unskilled, desperate for work, willing to learn and tremendously loyal. When I introduced new dishes to the menu I would often have to give a demonstration to the staff of how to cook it, as though one or two could read English, they did not always understand what the recipe demanded of them. The officers were complementary of my efforts in the kitchen and did remark that when I returned to England I should run a restaurant. Well I never did get to run the restaurant, but I shall be taking English Cooking in English at the local adult education centre next term, which is almost the same thing, since we will all sit down to eat what I teach them to cook at the end of the session. I for one am looking forward to the challenge.